The European Union's objective is, inter alia, to provide citizens with a high level of safety within an area of freedom, security and justice by developing common action among the Member States in the field of police mutatis mutandis in connection with other international cooperation. This resolution was replaced by the Council resolution of 6 December 2001 concerning a handbook with recommendations for international police cooperation and measures to prevent and control violence and disturbances in connection with football matches with an international dimension, in which at least one Member State is involved (2). 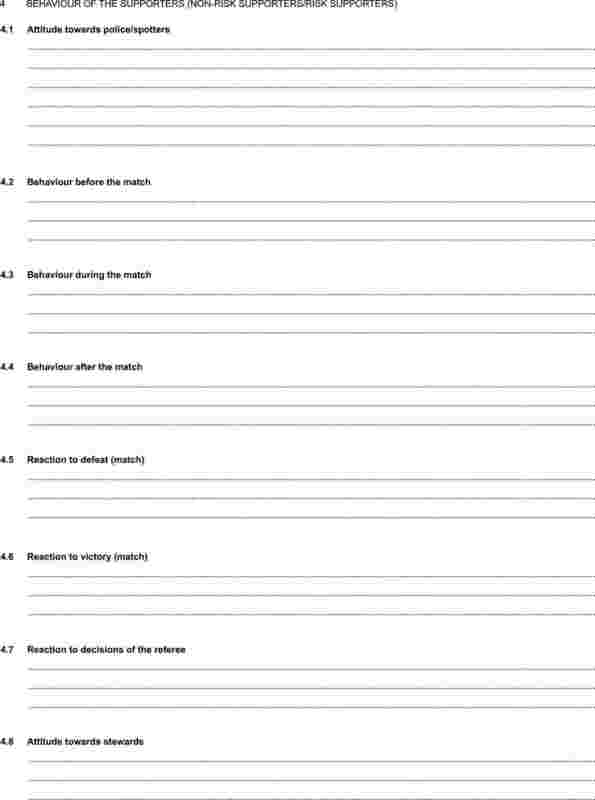 Taking into account experience in recent years, such as the European Championships in 2004 and the experts’ assessment of international police cooperation in the framework of that tournament as well as extensive police cooperation in respect of international and club matches in Europe generally, the handbook annexed to the aforementioned resolution of 6 December 2001 has been revised and updated. The Council requests Member States to continue to step up police cooperation in respect of football matches with an international dimension. To that end, the updated handbook annexed hereto provides examples of strongly recommended working methods that should be made available to police forces. This Resolution replaces the Council Resolution of 6 December 2001. (2) OJ C 22, 24.1.2002, p. 1. Organising authorities and police forces should take into account certain criteria that could be met with regard to information management. Organising authorities and police forces should involve police forces from participating countries in preparations at an early stage. Organising authorities and police forces should take into account certain criteria that could be met with regard to the organisation of international police cooperation. Organising authorities and police forces should involve those supervising fans from participating football associations in providing support for the tasks to be carried out and establish maximum cooperation with them. 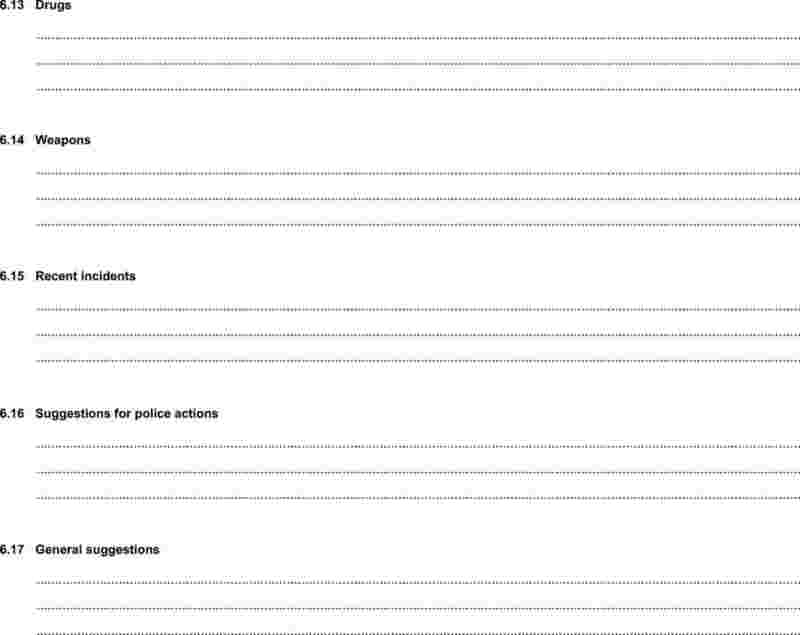 Police forces should make use of the media policy checklist. Organising authorities should take into account the set of possible requirements for organisers in different areas. A list of documents previously adopted by the Council will give an idea of the measures taken hitherto. The increase in various international and European competitions has given football issues an international dimension. With a view to the efficient management of football matches and, more specifically, in order to combat and prevent football-related violence, the exchange of information is of the utmost importance. To achieve this exchange of information, a permanent national (police) football information point (NFIP) must be established by each Member State. In accordance with Council Decision 2002/348/JHA (1) concerning the establishment of NFIPs, the NFIP in each Member State acts as the central and sole contact point for the exchange of relevant information for football matches with an international dimension, and for developing international police cooperation concerning football matches. A Member State may decide to organise certain contacts on football-related aspects through the relevant competent services, provided that the NFIP is provided with a minimum of information and insofar as it does not jeopardise the quality and the efficiency of the activities. The relationship between the NFIP and the competent national authorities is subject to the applicable national laws. Member States must take all necessary measures to ensure that the NFIP is able to perform its tasks efficiently and to a satisfactory standard. The NFIP should be equipped with the necessary technical facilities to perform its tasks efficiently and swiftly. The personnel of the NFIP should guarantee that the necessary police know-how is available with regard to problems concerning football matches. At international level, the NFIP's work on the basis of equivalence. By coordinating the exchange of information on football matches, the NFIP should contribute to public order, peace and safety, thus aiming at an efficient use of the available resources. The NFIP should also aim to facilitate international police cooperation regarding the police approach to the football issues and to promote the exchange of information between the police services of the different countries. The NFIP must support the competent national authorities. On the basis of information that has been analysed and assessed, the necessary proposals or recommendations will be addressed to the competent national authorities regarding the policy to be pursued by them on football-related issues. With regard to football matches with an international dimension, it is necessary that the NFIP has at its disposal, for the benefit of the NFIPs of the other countries, an updated risk-analysis related to its own clubs and its national team. In accordance with the applicable national and international legislation, the NFIP should be responsible for administering the personal data regarding risk supporters. The NFIP is responsible for coordinating the exchange of police information in connection with football matches with an international dimension. It could also extend this exchange of information to other law enforcement services which contribute to safety or public order. A distinction can be made between general information and personal information. tactical information: information that allows the person in charge at the operational level to respond appropriately in connection with order and security surrounding the event. In this context, personal information refers to information kept on individuals who represent or may represent a danger to public order or to security in connection with the event or who may have been involved in incidents, with a view to preparing or taking the appropriate measures (e.g. lists of stadium bans, photos of the persons in question, etc.). The information exchanged must serve a well-defined goal, i.e. contribute to the success of a specific mission. The use of the information supplied is limited in time and scope. The exchange of personal information is subject to the applicable national and international law. after the event: concluding phase where debriefing and evaluation take place. These three phases need not always be strictly separated. The term ‘event’ is used to mean a specific football match or tournament in all its aspects. At the strategic level, the information requirements are formulated, that is to say that the request for information has to be forwarded to the NFIP of the other country (countries). This request shall contain items such as the risk analysis of the supporters of the team in question, information regarding the team itself and its accompanying party (when there is a threat), information regarding spotters, etc. The NFIP of the organising country should also provide, if possible, information on aspects such as the applicable legislation and the policy of the authorities, information on the organisation of the event, identification of officials and police chiefs in charge, etc. All relevant information must be put at the disposal of the other NFIPs concerned. 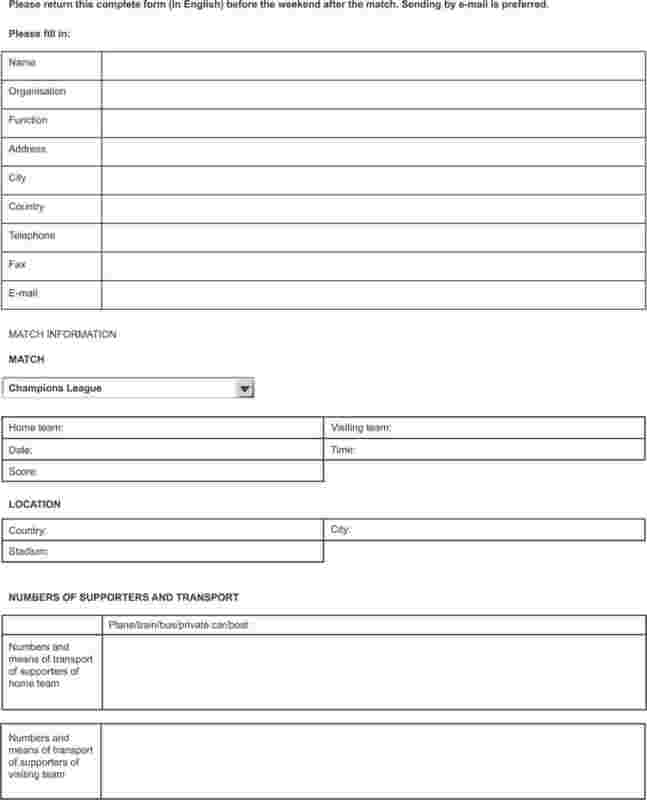 At the operational level, the NFIP of the other country (countries) is requested to supply information regarding the movements of normal and risk supporters, the participating team and its accompanying party (where there is a threat), ticket sales and possible requests for the participation of police officers such as spotters, and of supporter coachers, together with any other relevant information. The NFIP of the organising country can also supply information to the NFIP of the supporting country (countries) regarding the organisation of security, more specifically the integration of the spotters within the local security system, guidelines for the supporters, etc. All relevant information can also be put at the disposal of the other NFIPs concerned. At the operational level, the NFIP of the organising country can request confirmation of the information supplied, including the updating of the risk analysis. The request should be forwarded and answered via a system of liaison officers if such a system has been set up. At the tactical level, the NFIP of the organising country can provide the confirmation of the information supplied by having all the actors involved carrying out checks on the spot. Proposals may then be made for adjusting the measures. General information regarding the possible return of supporters that have been expelled and/or refused entry should also be supplied to the NFIPs of the country of origin and the transit countries. The NFIP of the organising country can in addition supply the NFIPs of the country of origin and the transit countries with the necessary information regarding the return of the supporters. 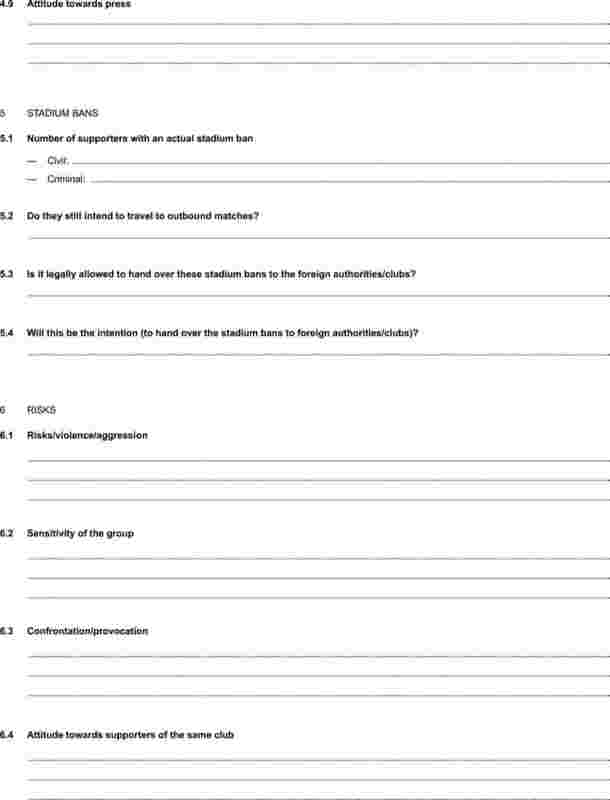 At the strategic level, the NFIP of the organising country should assess supporter behaviour so that a risk analysis of visitors can be updated by the NFIP of the supporting country. The host NFIP can also evaluate the process of information exchange. At the operational level, an assessment can be conducted as to the operational usefulness of the information supplied by the NFIP of the other country (countries) and as to the support supplied by the visiting country. The NFIP of the organising country can supply factual information concerning the reported visitors and a description of the incidents. Information regarding possible arrests can also be exchanged, with the legal possibilities being taken into account. The assessment of the foreign support should also be conducted. At the strategic level, the NFIP of the supporting country can supply on its own initiative all relevant information to the other NFIPs concerned. The NFIP of the supporting country should supply the NFIP of the organising country with answers to the questions formulated and provide relevant personal data as far as the law allows. At the operational level, the questions asked should be answered. More specifically, this concerns the answers to the questions concerning the movements of supporters, the participation of police officers such as spotters and the sending of supporter coachers. At the tactical level, preparations to integrate the police delegation can commence. At the operational level, the information supplied should be updated and the movements and stay of the supporters should be monitored. Useful information concerning supporter behaviour at home during the championships or a tournament can also be supplied. At the tactical level arrangements can be made for supporter movements to be monitored. At the strategic level, the risk analysis should be adapted. The processing of information regarding matches with an international dimension must be coordinated via the NFIP. The tactical, strategic and operational information is thus forwarded to the NFIP concerned. After being processed, the information can be used by the NFIP itself or forwarded to the relevant authorities or police services. Contacts between the police services of the different countries involved in an event are coordinated and, if necessary, organised by the NFIP. The police forces of the organising country should ensure that lines of communication and information facilities are clear to visiting police delegations, taking into account the nature of information. The NFIP or police service of the organising country should communicate with the national police force(s) of the participating country (countries) concerned throughout the championships and/or match via the liaison officer appointed and seconded by the country in question, if such a system of liaison officers is set up. The liaison officer can have responsibility for tasks relating to public order, violent football hooliganism and general crime, including terrorism, where it is connected with a particular football match or tournament. If a local football information point is also in place, it is recommended that this information point cooperates with the NFIP, the latter being responsible for managing the event except where the Member State decides otherwise. To this end, the NFIP can draw up the minimum criteria to be met in respect of this cooperation. The local and national points should keep one another informed. This information flow should take into account information provided by the liaison officer from the supporting country. The native language can be used for communication between the different NFIPs, with a copy in a working language common to the two parties, unless other arrangements have been made between the parties concerned. The NFIPs should communicate in such a way that the confidential character of the exchanged information is guaranteed. The messages exchanged can be stored and may be consulted at a later date by other NFIPs concerned, provided that the NFIP from which the information originates is provided with the opportunity in advance to give its opinion on whether the information should be provided. The police force of the organising country should shield the liaison officer of the visiting police delegation from any contact with the media, if the liaison officer so wishes. The liaison officer should be stationed at the NFIP for championships spread over a number of days and at the local football information point for one-off matches in the host country concerned. The NFIP of the organising country should make arrangements to channel information received from the visiting police delegation promptly to the proper authorities within its own police organisation. The NFIP of the organising country should appoint an information officer to be attached to the visiting police delegation responsible for reconnaissance or spotting. That officer should serve as a contact for the team leader and be responsible for the proper channelling of information. The police forces of the organising country should ensure that there are no differences in the quality of information available at local and national level. The NFIP can offer support to the competent national authorities. The NFIP can support the local police services with regard to national or international football matches. The NFIP can coordinate the exchange of information regarding national football matches and coordinate and organise the spotters' work. Permanent risk analysis means gaining an insight into the composition of the supporters groups, the hard-core supporters, their behaviour and into how they relate to each other, the other hard-core supporters, foreigners and the general public (various local population groups), etc. The NFIP can also act as a study centre and deal with the exchange of information on items such as the means and methods used by the organisers to improve security (stewarding, ticketing, accreditation), the means and methods used by the police services, the projects that may be developed to influence supporter behaviour, information regarding the spotters' work and the behaviour of supporters at home and abroad, etc. In addition to the police services, civil servants and academics could contribute to the role of the football information point as a study centre. The NFIPs can ensure the exchange of information with third countries. Should these countries not have a NFIP at their disposal, they could be asked to indicate a central, single contact point. The data regarding this central and unique contact point in the third country involved should then be forwarded to the other NFIPs. It is recommended that the NFIPs communicate through a secure data communication system. The NFIP can, should the need arise and according to the situation in the country concerned, also be used as a contact point for the exchange of information regarding sports issues other than football and/or regarding other matters besides sporting events. For international tournaments, the formal request for support should come from the minister of the department responsible in the organising country, who will receive advice from the NFIP concerned. For other football matches with an international dimension, the formal request for support should come from the NFIP in the organising country, who will receive advice from the police forces concerned. Taking into account the specific aims of cooperation, the request should indicate degree of support and its constituent elements and also the intended duration of the visiting police delegation's time in the host country. The detailed request for support should be agreed between NFIPs concerned well in advance of a championship and/or match. The visiting police delegation will require a certain preparation time. In that context, a request for support should be presented as soon as possible after the announcement of the date of the game. For one-off matches with an international dimension, the visiting police delegation will require at least three weeks’ preparation time. For international tournaments, the visiting police delegation requires at least 16 weeks’ preparation time. It is highly recommended that the countries involved (through their respective NFIPs) reach early in the planning phase a firm understanding on precisely which country and which agency will meet what expenses of international police cooperation. It is proposed as a general rule, for prior agreement on each occasion, that the host country should pay for accommodation and other facilities made available locally and that visiting countries should pay for travel and salaries of the officers involved. The police forces of organising countries should only request a visiting police delegation from countries that can contribute added value. This added value should be considered in the light of a number of factors such as professional experience of football-related violence, knowledge about risk supporters and being able to provide information so as to avert disturbances of public order and security. For countries which are involved and which want to contribute added value in the future, the opportunity can be given to learn from experience. Visiting police delegations are responsible for providing an advance risk analysis to be sent via their NFIP. This risk analysis should be sent to the organising country at least two weeks before the beginning of the game. For international tournaments, this risk analysis should be sent to the organising country at least eight weeks prior to the beginning of the tournament. In the first instance, a risk analysis of the supporter group from the country concerned should determine which of the five areas of police cooperation should be requested by the police force of the organising country. Police cooperation should, as far as intensity and extra deployment are concerned, move from intelligence gathering and communication with supporters to offering advice to the host police on crowd control measures as the risk of public disorder increases. Risk supporters should be accompanied where possible by members of the visiting police delegation who are acquainted with them. The composition of the visiting police delegation will depend on knowledge of the visiting supporters who are likely to be present. The possibilities for gathering reliable information from risk supporters about their intentions at the time of the event should be a decisive factor. The size of the visiting police delegation should be determined in consultation between the NFIPs of the host and visiting countries. The size of the police delegation should not therefore be the same for all countries, but should relate to some extent to the number of visiting supporters and the threat and risk they pose. The police force(s) in the organising country should provide an opportunity for the visiting police delegation to acquaint themselves with the organisation of police operations in the host country and/or the venue town(s) and with stadium location, and to get to know the operational commander(s) at the venue town(s) on the match day(s). For international tournaments, this should take place at least one month prior to the tournament; for international games, this can be on one of the days prior to the match. Efficient preparation of the police action in the host country is based on a comprehensive exchange of information, in accordance with the principles which are to be found in Chapter 1 of this handbook. 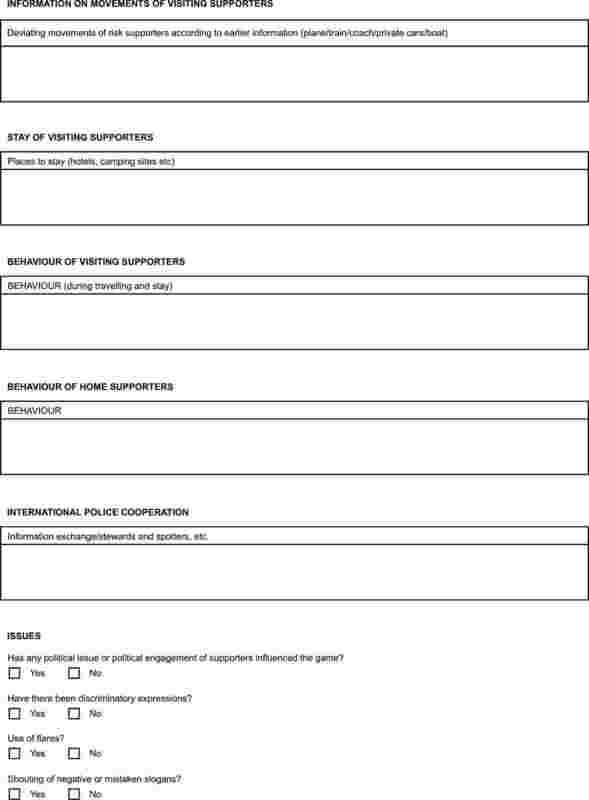 Police action in a host country can be qualitatively improved if police support in the field is obtained from at least the countries from which supporters come. The management of the local police forces and the NFIP must be kept informed about the work of the visiting police delegation throughout their stay. Maximum use should be made of the support that visiting police delegation can provide, which as such should form part of the host police organisation's tactical plan. This means that the visiting police delegation should be informed, in a language they can understand, about the host police organisation's tactical plan, that they should be given the possibility to attend briefing and debriefing procedures, that they should be given the opportunity to become an explicit partner in the information structure (so that they can give information as well as be informed) and that they should be actively included in the police deployment in the field. As regards the use of languages, arrangements should be made in advance by the countries concerned. The head of the visiting police delegation could, if desired, have his/her own press officer. The press officer assigned to a visiting police delegation should shield the members of the delegation from the media, if appropriate. The host police organisation should ensure the physical safety of the visiting police delegation by accompanying them throughout their stay. The visiting police delegation should always ensure that their actions do not unnecessarily jeopardise the safety of their fellow countryman or foreign colleagues. In case of emergency (i.e. when there is an immediate threat for his/her physical safety) or when it is jointly agreed for tactical reasons, the foreign police officer makes use of the standard luminous and distinctive visiting police identification vests, as described in Appendix 4. 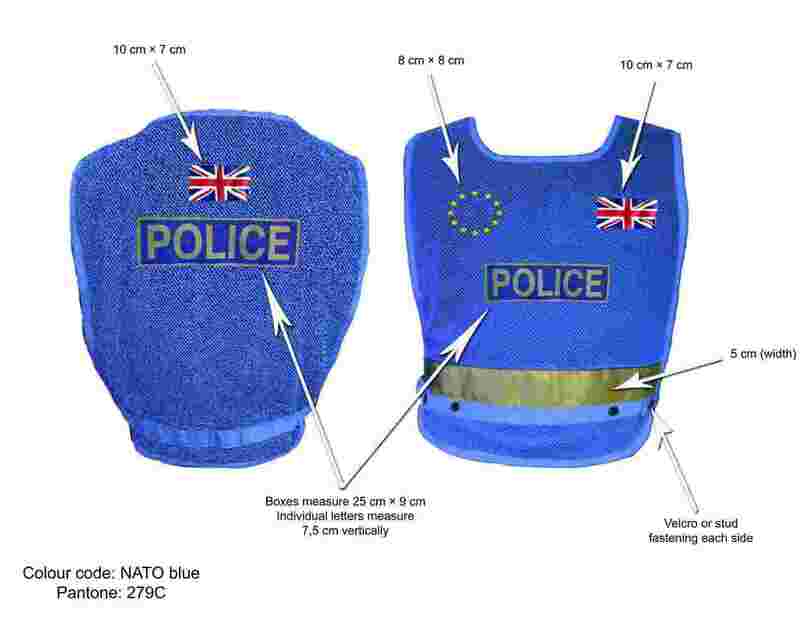 Each foreign police officer will bring this vest when he/she travels abroad. The police force of the organising country, in consultation with the football organisers, should ensure that the visiting police delegation has appropriate access and accreditation (seating not required) to enable the delegation to carry out their tasks properly. The stewards should be made aware of this at the briefing prior to the game. Where possible, the police forces of the country from which the supporters come should under the coordination of the NFIP supervise risk supporters from the start of their journey until they reach the country where the match is to be played. Responsibility will be duly transferred between police forces at national borders (including transport and railway police). With regard to the journey of these risk supporters, the necessary information should be forwarded to the organising country so that, insofar as the local law allows, these risk supporters can be prevented from entering the country. Countries which have the legal possibility to prevent risk supporters from travelling abroad should take all the necessary measures to achieve this objective effectively and should inform the organising country accordingly. Each country should take all possible measures to prevent its own citizens from participating in and/or organising public order disturbances in another country. The host police organisation should assign an appropriate accompanying police team based on the size of the visiting police delegation, with sufficient language knowledge and proficiency to maintain operational contact with the team and make reports. This accompanying police team should be sufficiently familiar with football hooliganism and with the tasks of the visiting police delegation, and should also have knowledge of maintaining public order and safety. The accompanying police team should be thoroughly briefed on their own task, on the task of the visiting police delegation and on the tactical plan of the host police organisation. The accompanying police team should stay with the visiting police delegation for the duration of the operation. The police forces of the organising country should have available sufficient interpreters for the languages spoken by supporters from visiting countries. This could save visiting police delegations from the various countries from having to do too much interpreting, which would keep them from actual operational tasks. These interpreters could also facilitate communication between the organising country's police forces and the visiting police delegation. The visiting police delegation should consult with the police force of the organising country about the equipment to be brought and the use made of it. Police forces and stewards’ organisations should work together on a complementary basis, without prejudice to each side's own responsibilities and tasks. The powers and tasks of any visiting stewards must be agreed well in advance with the host police and match organisers. The central aim should be seen as ensuring police authorities’ cooperation with the media in informing the public at national and international level of forthcoming championships and preparations and providing those attending matches with appropriate police advice concerning their security. Media policy is one of the instruments used in a communication strategy. It should demonstrate the supportive role played by the police and authorities in watching over the festive nature of championships. In order to ensure a balanced media policy, it is first necessary to determine the strategic aim. All further policy developments are geared to achieving that aim. Account must be taken of the media interest in specific information, such as the response by police authorities to the problems of football hooliganism and violence. This clearly signals what will and will not be tolerated. informing the public of police measures and the steps which will be taken in the case of disturbances. Media policy should never give the impression that nothing can go wrong, rather it should show that there has been proper preparation and that there are no grounds for panic. it should be geared to openness and transparency. organisation of press conferences before championships in order to make clear the approach to cooperation with the press. setting up a national working party on media policy cooperation. First determine what the crux of the message should be. Make this clear in interviews with the journalist/journalists. Do not express any standpoints which are not practicable. Where this happens, the power of the media instrument to influence behaviour is undermined. The policy announced by the police must therefore be maintained. Use the time between submission of candidacy and championships for careful preparation of a media policy specifying the individual roles and responsibilities of police/authorities. Include media policy throughout the planning stage and take the initiative in determining when the media will actually be informed. It is extremely important that exchanges of information and opportunities for press/media briefings are provided on a continuous and regular basis. Allowance should be made for the media's need for rapid information. Police and authorities should make sure in the case of specific media projects that sufficient attention is paid to the police in the area of police information. Once even a single incident occurs, the interest of the media switches swiftly from the sporting event to the public disturbance. Account should be taken of the fact that a sports reporter has a different angle from a police reporter. Account should be taken of the fact that the media will also seek information from sources other than the police. Special attention should be paid to police strategies and police intervention. Let the media know how the police/authorities will act when necessary. There are no grounds for fearing the media if police planning and preparations are adequate. The police should provide comprehensive information. That information should be verifiable and up-to-date. It is important to have confidence in individual police preparations and to display and communicate such confidence to the media. Police and authorities should assume full responsibility for their security arrangements. Measures should be taken to prepare police authorities for their contacts with the media. Ensure that the police officer maintains his contacts from an appropriate workplace. The media should preferably be contacted orally in person. Provide information about individual areas of policy responsibility and intervention. There should be clear agreements between the various authorities on who is to inform the media and the type of information to be given. Media appearances by police and authorities should concentrate on their own responsibilities and interventions. Partners should avoid discussions in the media or expressing recriminations over failures. Media policy should never be developed without consulting the other partners. Media policy itself is a process of cooperation. Where the police of the host country is given support by police teams from other countries, and the foreign police are approached directly by the media, it should be agreed that the matter be referred to the police information services of the host country. Exceptions to this rule may be made if the supporting police team, with the approval of the host country, has added its own specialist press officer (spokesman) to the team. In interviews/press conferences in the country of origin of supporters, use should be made of assistance by colleagues from that country. They have the facilities and press contacts and they know the local and national reporters, including the persuasions of the press organisations for which they work. The police services of the individual countries should draw up a list of the most important press services with the sectors they target for the police of the organising country. 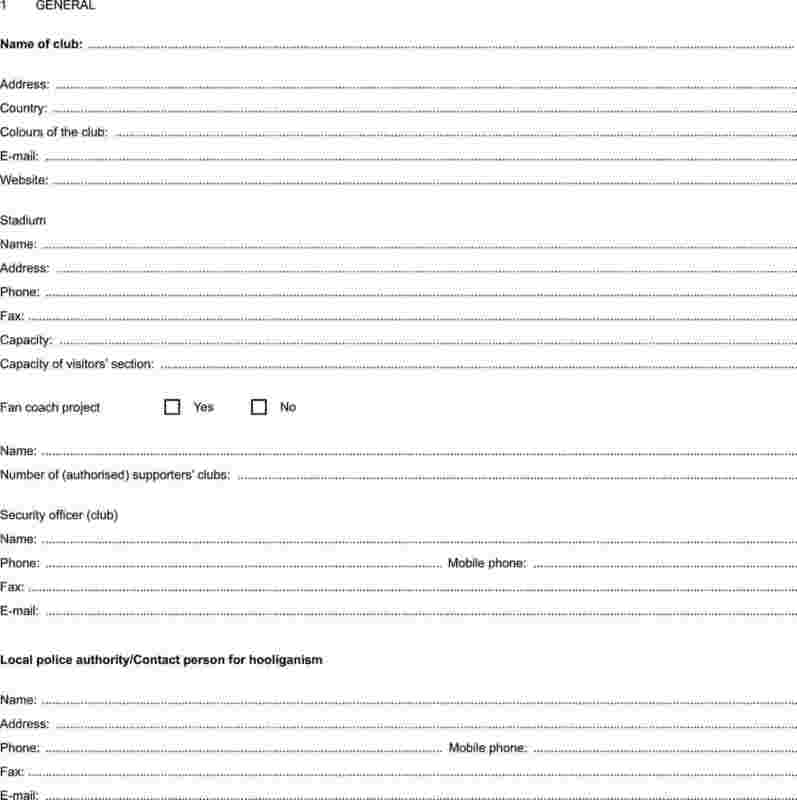 With the help of this list, the police of the organising country can supply those press services directly with information. In providing information on security, account must be taken of the type of press service and the sector which it targets. Sports reporters have less experience of providing information on security. This should be taken into account when drawing up press reports and issuing press releases. A joint working party should be set up involving all partners: the police covering the match venues, the central information office on football hooliganism, the football organisation and the national authorities. All representatives of police and authorities should communicate with the media on the basis of the same background information and with the greatest precision. In order to coordinate factual information, it may be useful to draw up common briefing notes and standard replies to regularly recurring questions. There should be daily exchanges of information on the questions asked by the media. an unambiguous message is conveyed (no subsequent arguments about ‘misunderstandings’). An information folder should be made available to supporters, indicating the kind of behaviour that is culturally acceptable or unacceptable and the kind of breaches of the law which will lead to action being taken. Advice should be given on ancillary matters with a view to ensuring that the supporters feel welcome. The folder should be distributed when tickets are sold. The public may be asked to take an active role by notifying the police of suspicious behaviour. The press office should close towards the end of the championships, but information should continue to be provided by the central police command office. Notification should be given of when the police press officer will be available for debriefing and a final press conference. When the championships have ended, an assessment report should be drawn up on the media policy pursued and experience with the media. Aspects with lessons for the future should be noted. This should also involve any police forces from other countries which have provided support. The police of the organising country should use the national assessment of media policy as a basis for deciding whether individual aspects of the European Union checklist require supplementing or adjustment. All the sufficient and necessary measures taken by the organisers of national or international football games should contribute to avoiding disturbances of the peace. An efficient policy as regards the organisation of national or international football games should be the result of an overall approach between all the parties concerned. Successful cooperation between the organiser, the private actors involved, the authorities and police services is therefore strongly recommended. Member States should identify who is responsible as the organiser of the match or, if responsibility is divided between two or more bodies, who is to be responsible for what functions. For the sake of public order and safety, the authorities and the police services concerned should impose on the organiser prior minimal requirements which they have to meet in order to organise national or international games. Such requirements mean that the organiser and other services concerned should assume the responsibility which is incumbent upon them and their aim should be to enable the police forces to concentrate on their principal duties of upholding law and order. The organiser of a national or international football game should take all the necessary precautionary measures in order to prevent damage to persons and goods, including all practical measures for the prevention of spectator misconduct. The organisers of a national or international football game should do everything in their powers to ensure public order and safety in and around the stadium, before, during and after the game, so that the police can be deployed as economically as possible. To this end the checklist in Appendix 3 could be used indicatively. It contains demands which the authorities and police services could impose on the organiser of a football game with regard to its organisation. It is recommended that those provisions be supported by national legislation. The expert meeting can commission subgroups of experts to consider emerging issues in the field of security in connection with football matches and make recommendations. Table of national contacts on hooliganism. (1) OJ L 121, 8.5.2002, p. 1. (2) Organiser refers to the legal or natural person who organises or instructs a person to organise, wholly or in part, a national or international football game, on his/her own initiative or on the initiative of a third party. 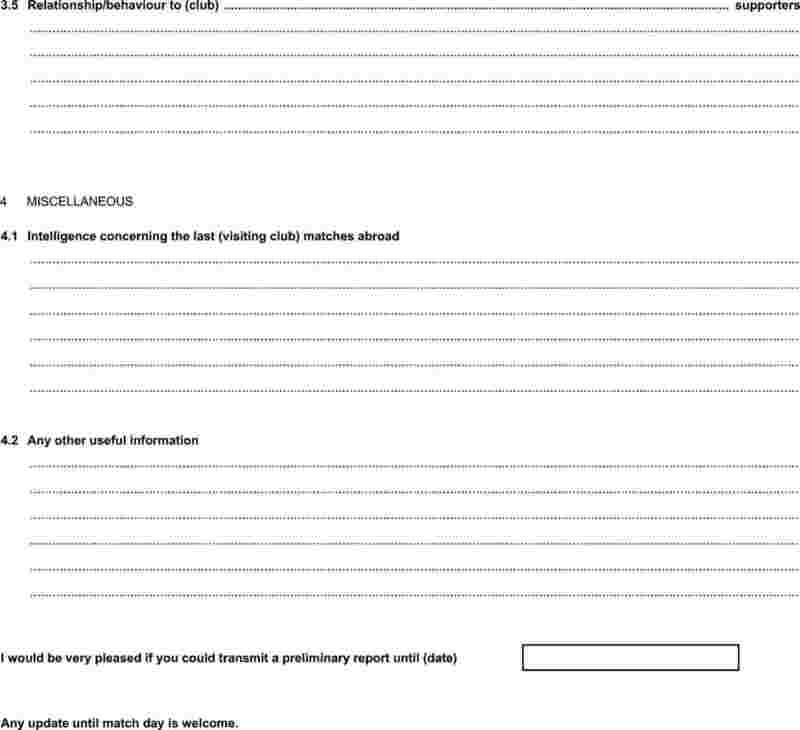 A person, known or not, who can be regarded as posing a possible risk to public order or antisocial behaviour, whether planned or spontaneous, at or in connection with a football event (see dynamic risk assessment below). A person, known or not, who can be regarded as posing no risk to the cause of or contribution to violence or disorder, whether planned or spontaneous, at or in connection with a football event. Identify the circumstances and behaviours that may contribute to incidents (not just profiling and categorising problem supporters). Clearly distinguish between risks for specific types of incidents, such as public order problems, public safety problems, criminality in relation to mass events and terrorism. 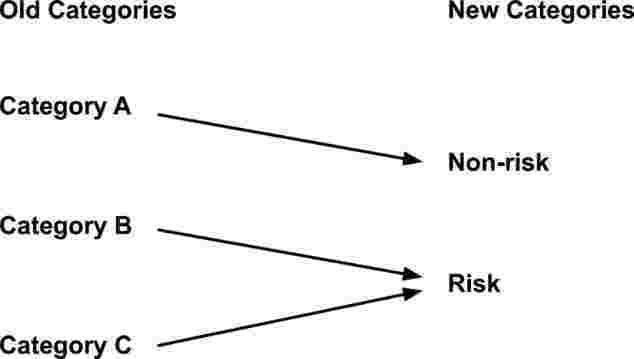 Distinguish between matches with normal risk and matches with increased risk (in relation to the four areas mentioned). Specify ‘increased risk’ wherever it is identified. 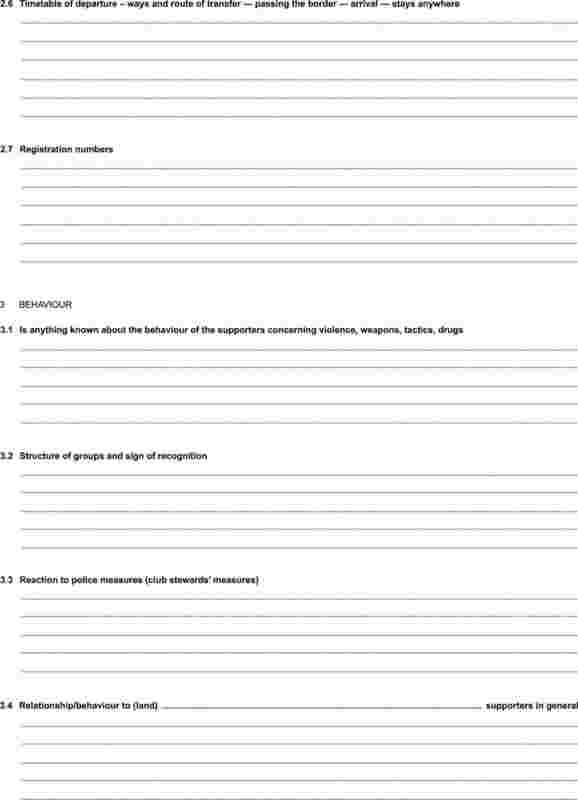 Identify behaviour by individuals/groups that is indicative of initiation of/involvement in incidents. The most effective way of policing public order is to maintain a balance between the perceived levels of risk and the nature of policing deployment. For a successful public order management to help decrease the likelihood of incidents, it is crucial that police tactics fit closely with the relevant risk assessments. It is of great practical importance to know and assess the social identities of the various (sub) groups of supporters, their values and standards, aims and goals, their sense of what is right and proper, their stereotypes and expectations of other groups, their history of interaction with these groups and anything (dates, places, objects forms of action) that has particular significance. THIS INFORMATION WILL BE USED ONLY FOR POLICE PURPOSES! The appointment of a safety officer for the coordination and conduct of safety policy. The safety officer is authorised to take operational decisions concerning safety. The safety officer has to be accessible at any time. As far as issues involving the organiser are concerned, the safety arrangements are made in consultation with the competent authorities and police services and with the safety officer appointed by the organiser. The stadium infrastructure makes it possible to separate efficiently rival supporters, both at the entrance and at the stadium itself. Only a stadium or parts of stadiums that conform to nationally and/or internationally imposed security standards are used. technical, electrical and gas facilities must be installed and maintained in compliance with the general standards in force. Sufficient, properly recruited and adequately trained stewards are required in order to receive and supervise the spectators. taking preventive action in any situation which is likely to threaten public order. In recruiting stewards, care must be taken to ensure that stewards meet the requirements as regards physical and psychological suitability for performing their tasks. a training course for certain matches. The stewards must be given regular refresher courses related to the developments and possible changes in the aforementioned areas. The stewards must be briefed prior to each match. The aim is to give the stewards the necessary information according to the specific circumstances of each game. When on duty, stewards must wear a fluorescent outer garment which distinguishes them from regular spectators and which bears the inscription ‘STEWARD’. The organiser or the authority concerned can call upon stewards from the visiting team. This kind of support is only useful when these stewards can provide added value. This added value is assessed in the light of certain criteria such as sufficient experience of working as a steward and knowing one's own supporters. Ticketing policy is an important instrument in promoting safety and order in stadiums. In particular, it centres on the separation of rival fans, prevention of overcrowding and control of spectator movements, and on enforcing stadium bans previously imposed by football organisations or other competent bodies. When establishing a ticket policy, organisers must take into account Community competition rules. In applying those rules, the Commission will take into account factors relating to the maintenance of order and safety. The distribution of tickets should ensure that fans of the participating teams are separated into sections. Ticket distribution policy and the allocation of tickets among participating countries should reflect ticket demand from fans in those countries. Sales policy should be designed to prevent black-market sales and ticket fraud. Fans should be prevented from buying tickets for a section of the stadium not designated for them. Tickets should provide information about the holder of the ticket, its origin, the game to be played and the assigned seat; in short it should provide a history. The separation of supporters is achieved by a strict allocation of tickets providing seats or standing places to separate rival groups of supporters. This means that, the place (seat) in the stadium is determined by the team followed and/or the nationality of the supporter. Ticket policy should be designed so that allocation and hence separation of rival fans cannot be circumvented through the transfer of tickets in any form. Overcrowding is prevented by ensuring that the number of tickets allocated for open sale is determined by stadium infrastructure. The prevention of counterfeit or forged tickets will also prevent overcrowding. Should it not be possible to separate supporters under given circumstances, alternative security measures ought to be provided for the ground sections in question, e.g. reinforced closed-circuit cameras, more stewards, separate entrances, etc. The basic premise is that the admission capacity of each stadium will be determined in the light of risk analysis and that the full capacity is not completely sold. Some leeway is necessary in order to admit fans with tickets for the wrong section, which is determined by the team supported and/or the nationality of the fans. Spectator movements in and around the stadium are controlled by adequately dividing the stadium into recognisable sections and providing relevant signposting. Stadium bans are enforced by the arrangements made for applications for and distribution of tickets and by measures against any form of transfer of tickets issued. Registration by the organisers as part of ticket control forms an important source of information for the organisers, the management and the police. Match and stadium data should be given. Code of conduct for fans. Conditions for admission to and presence in the stadium in the spectators' own language. Name of the holder and name of the ticket agent/distributor. In principle, the buyer of the ticket is also the end user. spectators at matches must agree to being searched when entering the stadium and are required to produce identification, on request, when presenting admission tickets. In information campaigns, the organiser should publicise the official sales outlets and method of sale and urge the public not to buy admission tickets elsewhere, warning them that the distribution system leaves no scope for black-market sales. The organiser should continually monitor ticket holdings per country and per distributor. Available tickets should be distributed to target groups in such a way as to allow sufficient tickets, in all fairness and to the extent permissible under Community competition rules, both for the general public and for fans of participating teams. The organiser must impose an obligation to return tickets on national associations in countries with insufficient sales. The organiser must impose an obligation on the official distributor to return unsold tickets. The organiser should bear in mind that distribution and sale of admission tickets in batches will improve control over the sale process. The organiser should impose reliability requirements for distributors. In the event of irregularities, the organiser should have the power to intervene in the distribution process at any time. The organiser should impose an information requirement on distributors, who should inform the organiser of the progress of ticket sales, if possible together with travel schedules and accommodation. If applications for tickets are not made exclusively within national associations or the individual football clubs of spectators or fans, individual applicants should indicate the team they support. This can be taken into account on public order and safety grounds during the final allocation of tickets. Admission tickets should not be transferable. Persons on whom stadium bans have been imposed will not be issued admission tickets. Purchasers will not be supplied with more than two tickets. The tickets will be issued in their names. The final delivery of tickets should be as late as possible (exchangeable vouchers). The organiser must provide assurances that the person whose name appears on a ticket, the ticketholder, will ultimately receive that ticket. The organiser will announce in advance those spectators who will be admitted to the stadium and those who will be refused admission. Those on whom stadium bans have been imposed will not be admitted in any case. Spectators clearly under the influence of alcohol will not be admitted. Spectators will not be admitted if they are carrying objects that could pose a threat to safety and order in the stadium. Spectators will not be admitted if they are carrying objects that in any way reflect political aims, discrimination, racism or insulting attitudes. Admission controls should be of a high standard, including the searching of persons and enforcing of stadium bans. Smooth admission controls should prevent lengthy queuing. Admission controls should guard against overcrowding of stadium sections. Where automatic admission systems are used, they should meet high standards of reliability and continuity. In addition to the ticketing policy, the accreditation strategy represents one of the key instruments in order to ensure safety in the stadium. The accreditation system is to prevent overcrowding and must make it possible to manage the crowds and to undertake crowd control. Accreditation is given only to the person who is to perform a specific function within a definite area of the stadium, and the accreditation is issued only for the given area. The accreditation does not entitle the person to a seat in the stadium. An accreditation is not transferable. The accreditation has to be fraud-proof. Stadium regulations are laid down in writing. They comprise the organiser's internal rules, and set out as a minimum the prohibited items and the forms of behaviour which are not tolerated, as well as rules with regard to the handing in of objects. The supporters are notified clearly and continuously of the ground regulations. The necessary measures to ensure implementation of the ground regulations and to check their observance are taken. A regulation on civil-law exclusion is laid down. This exclusion is imposed on people whose actions or behaviour infringe the stadium regulations. The necessary measures to ensure the enforcement of the civil exclusion and to check its observance are taken. The organiser of a national or international football game concludes an agreement regarding its obligations, with the authorities, the police services and emergency services concerned. This agreement makes it possible to lay down the organiser's obligations in a contract and make them enforceable. This agreement is drawn up within a reasonable period of time prior to the game, tournament or competition and includes the organiser's obligations and responsibilities. the agreements concluded with regard to the organiser's obligations and responsibilities, more precisely with respect to the ticketing and accreditation policy, the deployment of the stewards, the closed-circuit camera security system, the alcohol policy, the agreements concerning prohibited objects, the agreements as regards the exchange of information with the organiser (in particular any information in respect of the police services concerning the programme of football matches (competitive games or friendly games) at international level, which involves consultation before the date of the game is decided), etc. The organiser of a national or international football game and all parties involved including the police and local authorities, the supporters’ clubs, the local residents (or residents’ associations) and the transport companies conclude a local charter, which aims at building a relationship based on mutual trust. This local charter guarantees thus the safety of all the supporters, local residents and other parties involved, both inside and outside the stadium. reaching agreements with the transport companies involved. 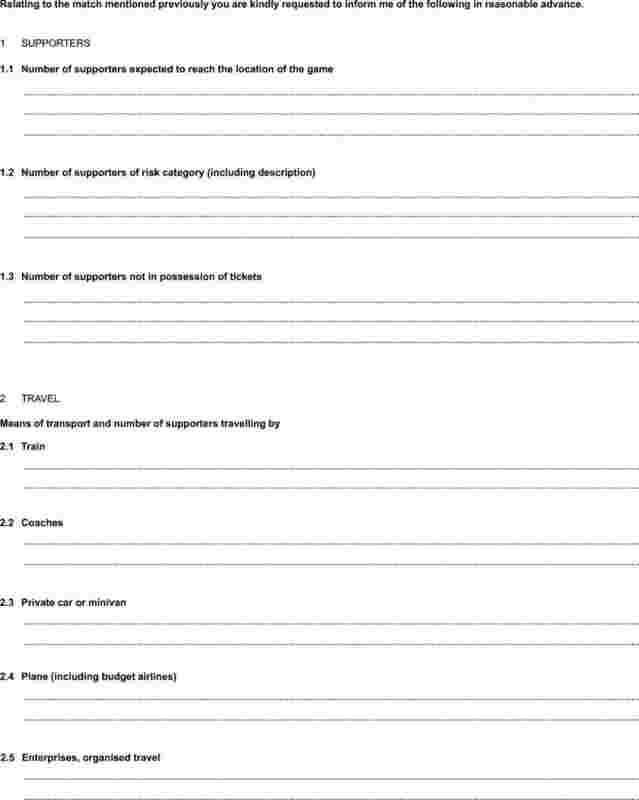 The organiser of a national or international football game includes in this local charter a timetable for achieving the various schemes and/or initiatives to be launched. (1) This relates to (an) agreement(s) that can be concluded with the different organisations involved in the football events and may involve the imposition of requirements or the issue of permits by the public authorities. This in turn can result in liability for damages. Single word: POLICE (in English only) with a box border — to be positioned in the centre of the vest both front and back. Left breast (above POLICE box): national flag 10 cm × 7cm - embroidered/sewn on or in a plastic sleeve. Vests should be able to be secured by means of either Velcro or popper-type fasteners on both sides.